In the fall of 2018, LPI held beta exam labs for the updated LPIC-1 certification. Exam development is a complex process, both when it comes to updating existing certifications, and when it comes to developing new ones, such as the DevOps Tools Engineer which we released a year ago. Updating existing certifications starts with a community consultation that is done through the 'LPI Exam development mailing list', which is an open group that anyone interested in LPI exams and exam development can join. The main outcome of this discussion is the updated set of objectives. Once the objectives are finalized, our certification development team starts to write exam questions. In order to gather an initial set of psychometric data and to get better insights into the quality of exams, LPI organizes beta exam labs worldwide, where candidates take a paper-based beta version of the exams. The results and feedback of the beta exams are fed back into LPI's quality assurance process. Together with additional psychometric studies which run in parallel to the beta exams, they help to ensure that the final grades of the beta exams, as well as the final versions of the exams, exactly reflects the skills of the candidate. Beta exams are always taken in the form of paper-based tests. After the exam, candidates are asked to fill in a survey about the exam and experience, which also helps the process of improving the exams. As a result, it took close to 10 weeks to collect exams from all over the world, scan them, process the results and feedback, and conduct psychometric analysis. Let’s talk more about the recent LPIC-1 betas. LPIC-1 is our most desired certification. The demand for tests was extremely high and we had to reject many requests to seat larger numbers of beta exam takers. Beta exam labs were held from May 21, 2018, to July 10, 2018, and they were delivered in English and Japanese languages only. These betas were special as they were offered in Japanese language for the first time. Thank you to all the SMEs who contributed to translations and made this possible. In Africa, events were held in Kenya, South Africa, Tunisia, and Nigeria. In Asia, we held exam labs in Japan and Lebanon. In Europe, events were held in Germany, Netherlands, Poland, France, Italy, Spain, Turkey, and the UK. In Latin America, exams were held in Brazil, Argentina and Mexico. In North America, exam labs were held in Ontario, Canada, as well as California, Texas, and Tennessee in the US. LPI had great support in all the partners who organized events, as well as the candidates who responded and took tests. There are more benefits for the beta exam labs than just developing the quality exam items. By organizing exam labs worldwide, we get to be in touch with our community and learn more about them with the support of our partners. Thank you, all. 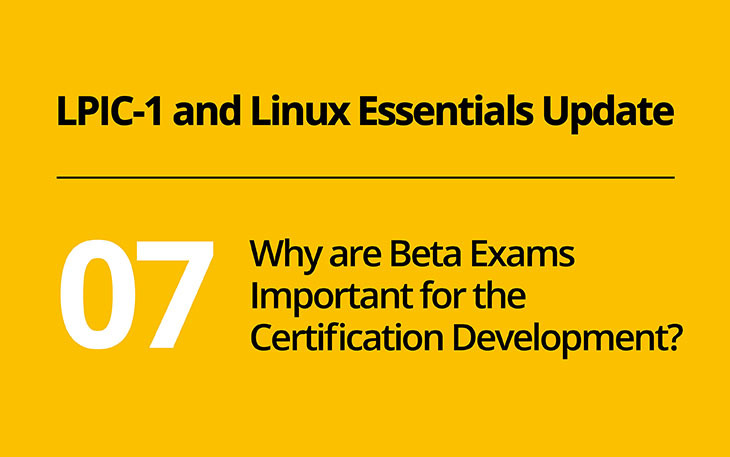 As I’m writing this post, the next beta exam labs are already on the horizon. LPI just started updating the LPIC-3 exams, so candidates can anticipate beta exam labs this year. Interested candidates can follow LPI social media and news on www.lpi.org as we will make sure to announce it there as soon as events are scheduled. Exam takers should start preparing for the betas early enough so they have fair chance to pass the exam and provide helpful feedback. If candidates want to be awarded with LPIC-3 certification, they should make sure they hold LPIC-2 certification. Even though LPI exams can be taken in any order, candidates should make sure they are prepared and make sure they use their time in the best possible way. The updated objectives are available on LPI’s Wiki page, as well as the difference between current and new objectives (once they are outlined). There’s available knowledge content for each of the objectives. Only prepared candidates pass beta exams, and having in mind the cost of regular exams, candidates can get financial advantage by taking beta exams. To all candidates, good luck with your exams, whether you decide to take beta or regular exams.